Audrey prefers performing autopsies on unfortunate cadavers than the more respectable tasks of keeping a home and conducting herself like a proper young woman much to her widower father's chagrin. She would rather be in the company of her uncle, a doctor and scientist often called upon by the authorities to help unravel mysteries around the city. There is a killer on the loose and her uncle has a new assistant, making things very interesting for the young, adventurous woman. Maniscalco is a debut author in James Patterson's imprint for kids and teens. He has the auspicious goal, like most librarians and educators, to teach reluctant readers to be voracious readers by getting exciting, thoughtful, funny books in their hands. This is one of those attempts. 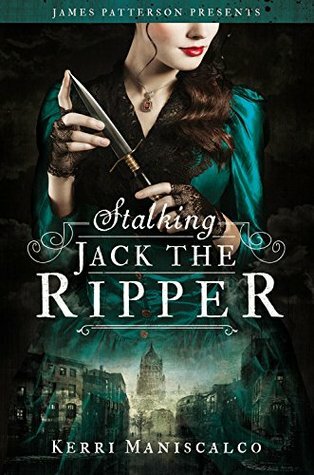 Stalking Jack the Ripper has just enough horror, gore, and thrilling adventure to snag a reader right from the start. It's fast-paced yet thoughtful, and offers a mystery that keeps you guessing throughout. And it has the legend of Jack the Ripper which is always exciting. It's not perfect. Character development is lacking, and I didn't feel like it gave you enough information to even attempt to figure out the ending on your own. Grant it, I'm not the most observant of readers, often surprised by the smallest of twists because I get too invested in the plot, but still. Overall, a decent read, and one that I'll be using in my library, especially to those reluctant teens who claim to hate reading. maybe they just haven't found the right book yet. Challenge accepted.